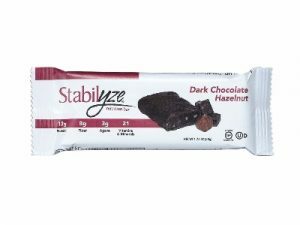 Stabilize nutrition bars prove to be a delicious snack! Finding a tasty snack or protein meal replacement can be challenging. Having multi flavor is always something to take into consideration; All Dark Chocolate: Coconut Cashew, Thin Mint Cookie, Peanut Butter Cup, Hazelnut all great for a quick grab and go. The key ingredients are Whey Protein, Nut Butter, Fiber, Agave syrup and vitamins and minerals. Www.Stabilyze.com for info or to order. These nutrition bars are both Certified Gluten-Free and Certified Kosher.